Fast-paced, on-the-go, and with a crucial priority for high-speed connectivity, the world today has increasingly higher and higher demands for the best Internet performance—and your Small Office/Home Office (SOHO) environment is no exception. Powered by a dual-core processor, the DIR-882 AC2600 MU-MIMO Wi-Fi Gigabit Router is a formidable wireless networking solution that can help you make the most of your broadband connection because it is designed for high-bandwidth applications such as HD, 4K, and 3D video, all of which you can easily enjoy in your home, hassle-free. Depending on the ISP on the WAN side, the DIR-882 has a Gigabit WAN port to support faster Internet connection speeds of up to 1000Mbps/1Gigabit. The Wi-Fi speeds on 2.4GHz (up to 800Mbps) and 5GHz (1,732Mbps) add up to a total of 2600Mbps. If these are combined via the four Gigabit LAN ports, the DIR-882 can upgrade network speeds locally while streaming and transferring files for the fastest Internet access ever. Multimedia applications these days are in constant need of seamless HD streaming. Whether you’re making online calls, playing multiplayer games, or surfing content-rich websites, two concurrent wireless networks are essential to everyday productivity. 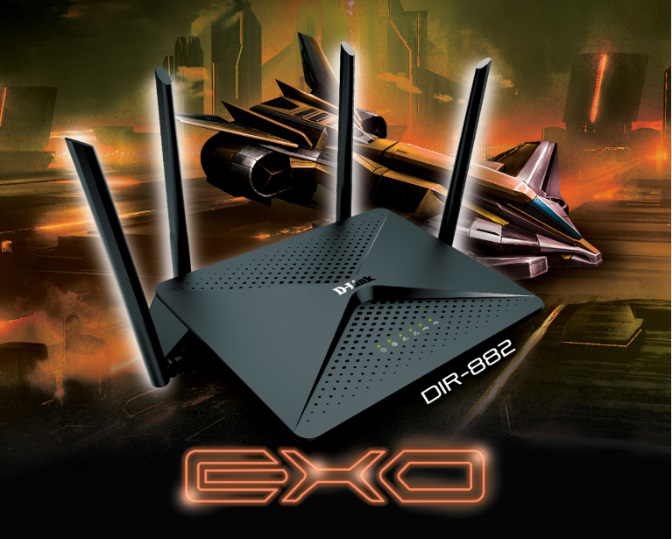 On top of the dual-band Wi-Fi, the DIR-882 features improved range, backward compatibility, and a state-of-the-art QoS engine to help prioritize traffic to ensure uninterrupted bandwidth. With the 4x4 Multiple Users-Multiple Input, Multiple Output (MU-MIMO) antenna configuration, you can get concurrent communication with multiple compatible devices, which means faster speeds and smoother streaming of 4K video and online gaming. Built based on the latest 802.11ac wave II technology, the DIR-882 boasts four 10/100/1000 Gigabit Ethernet LAN ports for Network Attached Storage (NAS), media centers, and gaming consoles. With the Super Speed USB 3.0 and USB 2.0 ports, you can share movies, photos, files, documents, and music instantly, or even stream media files or listen to your whole music library on the USB. Best of all, the lightweight portability of the DIR-882—a mere 10.1x7.2x1.8 inches and 1.25 pounds—goes perfectly well with its sleek, elegant, and futuristic design. Your router has never been this cool. Using the simple web-based setup wizard, you can immediately take advantage of the DIR-882’s mind-blowing features in no time. Create your wireless connections as simply as can be with the Wi-Fi Protected Setup (WPS). With the advanced algorithms from D-Link’s Smart Connect Technology, you can identify the best connection for your device by letting the DIR-882 automatically distribute the devices to the most optimal wireless network for best connection and stability. The Smart Beam technology will detect the location of the connected devices and focus the wireless communication accordingly to provide a wider coverage. Ready for a wireless connection like no other? Rest assured that your connection will reach the farthest corners of your home and office environment. The DIR-882’s antennas have been meticulously designed to keep away from as many dead zones as possible. Boost your connectivity with D-Link today. The DIR-882 will be available in the Philippines on October 2017 with an SRP of Php11,490.